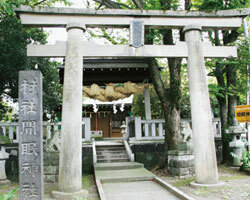 The 1st grade shrine of Izu Province, Mishima-no-okami includes two sub-shrines; Oyamatumi-no-mikoto and Tsumihayae-kotoshiro-nushi-no-kami. Unfortunately, the construction date of these shrines is not documented precisely. However, according to one of the ancient chronicles, it is recorded that from ages ago, the government and the people admired the shrine as the root god of Fuji volcanic belt. 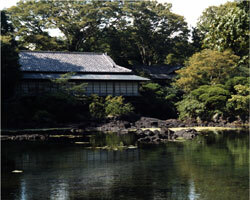 It is also well known that one of the most famous Shogun, Minamoto no Yoritomo worshipped here for the fortune of wars. The foundation of the shrine perfectly kept the original style of architecture and its materials such as 1200-year-old orange osmanthus tree registered for National Natural Treasure. 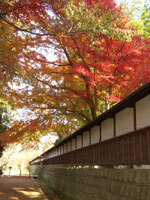 Moreover, the National Important Cultural Property is granted for the shrine palace made of raw zelkova tree. In spring season, the shrine is decorated with blooming Someiyoshino cherry blossom, and Mishima sakura, new breed invented in Mishima. 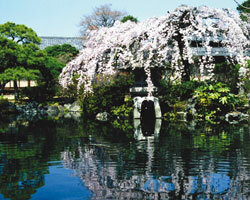 Every summer a lot of photographers visit the shrine to photograph the reflection of sakura on Shinchi pond. You can also enjoy sakura tree during the night. Many visitors come to see the beautiful sakura tree lighted up in the dark. In August, Mishima Summer Festival is held. It is the biggest and the most exciting event in Mishima and surrounding areas. Many cultural properties are collected and parts of these are exhibited such as Apricot-relief Gold-lacquered Box dedicated by famous Shogun's wife Hojo Masako, ( National Treasure ), Japanese Sword named Munetada ( National Important Cultural Treasure ), and Heart Sutra written in sumi ink by Shogun Minamoto no Yoriie (National Important Cultural Treasure). 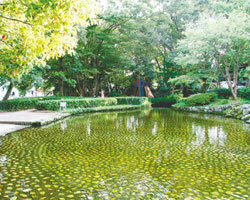 This city park was constructed as Prince Komatsunomiya Akihito's cottage. The park has a great diversity of vegetation. Over 160 species of trees are growing on lava flow from Mt. Fuji. Apart from beautiful nature, the park is also equipped with small animal farm, local history museum, small recreational kids' ground and original steam locomotive. In addition, some seasonal events such as Chrysanthemum Festival are also held at this park. People from any age group can visit the park and enjoy their time. Fireflies dance along Genbe River at night in early summer. The origin of the river is melting snow from Mt. Fuji. The river also flows through Rakujuen Park. 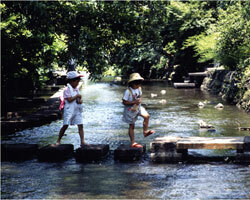 In the river, there are stones and wooden paths for you to hear the sound of stream while walking. Yamanakajo Castle was constructed as a defense base for Odawara Castle by Late Hojo clan in the 1560s. However, in 1590, the castle was tragically captured in a half day by overwhelming number of army led by Toyotomi Hideyosi. In late1590s, Toyotomi Hideyoshi succeeded in occupying whole Japan. The castle ranked in one of the top 100 castles in Japan for its history and construction method. 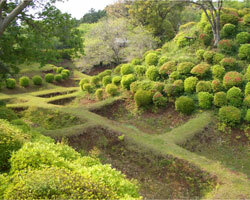 Yamanakajo castle was made only from clay whereas majority of castles were constructed with stones. Clay castle is a significant feature of Hojo period. Shoji-bori and Une-bori are other example of clay castle. Nowadays, the ruin of Yamanakajo castle is popular site for tourists and locals. Since the castle is positioned halfway up Mt. Hakone, the great scenery of Mt. Fuji and Suruga Bay can be viewed from the park. In addition, Mishima vegetables are grown at the foot of Mt. Hakone. You can purchase them on the way back to city center. 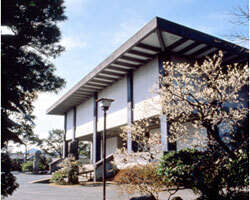 This museum is popular for oriental antiques and artifacts such as Japanese swords, bronze wares and ceramics. The display items are changed periodically. Thus every visit would be new fresh encounter. 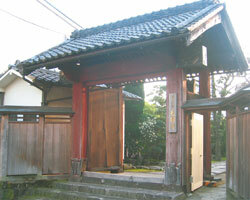 This is the masterpiece of the early Showa period architecture, combination of Shoin and Sukiya style. The gorgeous garden in spring ensures all visitors relaxing atmosphere. 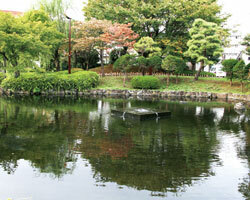 Colorful carps are swimming in Komoike Pond which is the headstream of Sakura River. Let’s take a rest on a bench near water. A recreation area with the sound of stream is popular throughout the year. Especially, in summer, the park is crowded with children playing in the water. 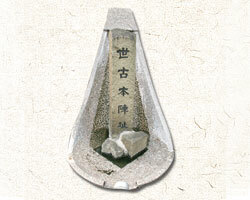 You may drink fresh snowmelt water flowed from "Megumi-no-ko". You may enjoy the tranquil scenery of beautiful streams while reading haiku poetries associated with Mishima by Japanese great poets such as Bokusui Wakayama and Shiki Masaoka. Mishima Baikamo can be seen in Genbei river. Mishima Baikamo, botanical name:Ranunculus nipponicus (Makino) Nakai var. japonicus (Nakai) Hara grows only in clean cold water. It is named "baikamo" because the flower resembles white plum blossoms (Baika). 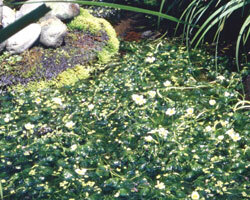 This precious plant was firstly discovered in Kohama Pond in Rakujuen Park. This museum is the renovated house of Kawai family who had been publishing Mishima Calendar for generations since Kamakura era. In the museum the printing blocks of Mishima Calendar and reference materials are exhibited, and there is a course you can learn the process of publishing calendar. It is said that Minamoto no Yoritomo copied a Sutra and dedicated it to the temple for reconstruction of Genji clan. The Sutra was buried in a mound in accordance with the ritual of those days. The Jizo statue was settled on the mound later as a monument. "Madoromi" means "doze or nap" in Japanese. This shrine was named "napping shrine" because Yoritomo dozed off under a big tree in this shrine on the way home from 100-days pray for the reconstruction of Genji clan at Mishima Taisha Shrine. It is said that Yoritomo prayed for his foot pain at small shrine in this temple. Because of this legend, Jizo-bosatsu was installed as the principal. 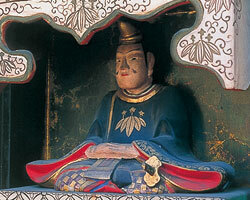 Alongside the principal image is the wooden figure of Yoritomo. 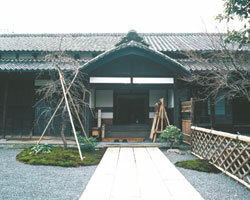 The two honjin were used as an accommodation facility for government officials during Edo period. 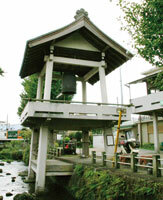 In present, the Higuchi-honjin was moved and function as a temple gate. 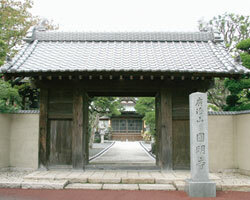 The gate of Seko-honjin in front of the Higuchi-honjin is now moved to Choenji temple nearby. 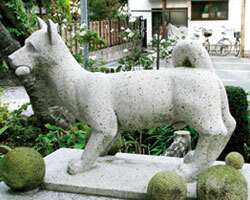 Once upon a time, a mother dog and five puppies lived under floor of the mail hall of Enmyoji Temple. On a cold winter day, the smallest puppy died of disease, and the mother dog also fell sick from sorrow of losing her kid. The remaining four puppies split up and strived to take care of their mother day after day, warming mother's body up and getting a food from people. Their actions impressed people and became the legend of the town. In spite of puppies' care, the mother dog died in next summer. The barks of puppies echoed in the sky and moved the town people's hearts. When the four puppies were found to be dead closely to their mother, the people raised the tomb for the memory of the puppies' devotion. According to the policy adopted in Tokugawa government during Edo period, groups of daimyou, feudal lords are obligated to travel between their territory and edo, Tokyo. This duty, Sankinkoutai was done once a year to prove their loyalty to Shogun, imperial court. Honjin Ruin was the place where daimyou changed their horses and rest. In Mishima-juku, there are accommodation named Seko-honjin and Higuchi-honjin for the officials. Though none of the buildings still remain, there are historical monuments. This was made during Kanei period in Edo era. It functioned as clock ages ago over Mishima-shuku post station. Currently, it is only used as the bells for New Year's Eve. This Temple can be found in the nature of Mt. Hakone, far from Mishima downtown. 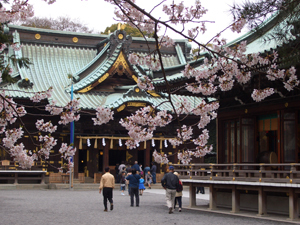 At first, it was built at Kamakura during Kamakura period by Nissho-shonin. He is famous for establishing a disciple of Nichiren sect. 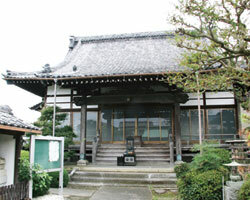 In Edo period, the temple was relocated to the current place. Three notorious people involved in the relocation of this temple. The first person is Oman-no-kata, a concubine of Tokugawa Ieyasu (the founder of Edo government). She was also a grandmother of the famous daimyo, Mito Mitsukuni. Secondly, Okatsu-no-kata, another concubine of Tokugawa Ieyasu and thirdly, Ota sukemune who was a daimyo contributed in removal of the temple. 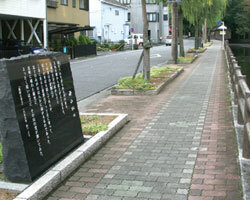 The surrounding wall called Hyakkenbei is well-known for photograph spot. Especially the cherry blossom in spring and autumn tints are the popular ones. 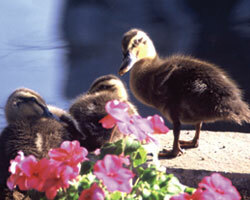 Moreover, visitors can enjoy flowers at any time of the year. The magnificent gardens are another must-see attraction. Adjacent to the temple, there is a treasure house, where you can see important cultural property registered statue of Nichiren.